For Piccolo and Piano Reducton. 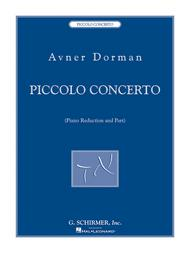 Composed by Avner Dorman. Woodwind Solo. Classical. Softcover. 42 pages. Published by G. Schirmer (HL.50485996). This concerto may be performed as orchestrated or with piano accompaniment. It features three movements coming from three distinct styles: Baroque and classical, ethnic/Middle Eastern, and jazz and popular music. June 22, 2012 Awesome piece! I first heard this piece on WQXR's Q2 with Mindy Kaufman as the soloist. Amazing piece. Recording's awesome too (it's on Naxos and on iTunes). September 12, 2008 Absolutely brilliant! piccolo/piano reduction at the University of Florida in 2003 during my graduate recital. Since then, the work has increased in popularity, thanks to many prominent piccoloists who have discovered how wonderful of a concerto it really is. With the piccolo repertoire expanding every few years, this one definitely ranks up there with the best. Not for the beginning piccoloist at all, but every serious college student and professional will have a blast with the exciting technical passages and beauty of the slower movement. The piano part fits brilliantly but if you get a chance to perform the orchestral version, you must!